You know, I almost said, "spent a lot of time on things we didn't want to spend time on," but that's probably not true. Right? These night be all the things we DO WANT to do rather than work. So what are some of these accidental breaks we take? Once we've thought about the breaks we take, we should figure out "What triggers us to take a break?" We should plan when to take breaks for things like these so we don't feel deprived. And tell ourselves "No" when it's not break time. Realize what you’re trading the time for. Conversation of the day: What is an accidental break you often take? And what triggers you into taking the break? 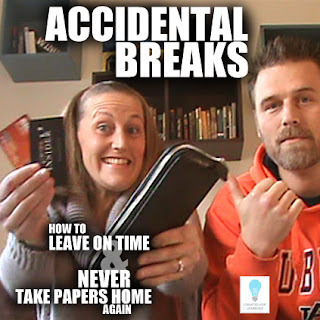 In this YouTube vlog, we're back with our series: How to Leave on Time and NEVER Take Papers Home Again. Each episode will tackle a topic that will help us move steps closer to this elusive goal. Today, we're talking about what it would look like if we worked at work and only worked at work. 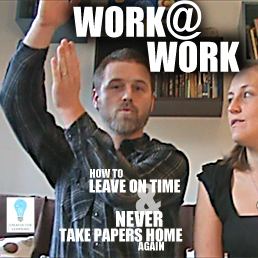 How come we work at home? How come we don't work at work? How come when we work at work we still have to work at home? Hop on over and share your thoughts in the conversation. Today, we're talking about what kind of grading style we should use and when. 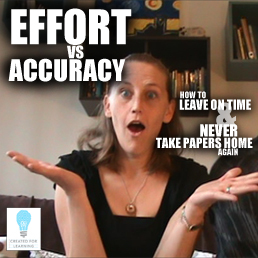 Should we grade each question right or wrong or should we give them credit for effort and completion? And when is a good time to do these approaches? Is there a way for us to save time at school, so we can work less at home? Today, we're talking about how much To-Do Lists can help us teachers save time and stay focused in our classrooms. Hop on over and share your thoughts in the conversation. 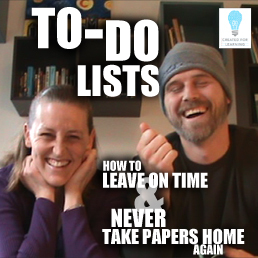 In this YouTube vlog, we kick off a series that seems super timely for us teachers: How to Leave on Time and NEVER Take Papers Home Again. Each episode will tackle a topic that will help us move steps closer to this elusive goal. 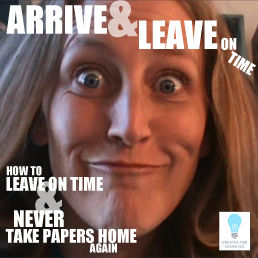 Today, we're talking about a crucial step: Arriving and Leaving on Time. Hop on over and share your thoughts in the conversation. Years ago, I heard about a legendary Harvard study where they wanted to see if writing down your goals made any difference about whether or not you accomplished them. A whole class of grads wrote down their goals, and the school checked back with them decades later to find they were wildly successful and had accomplished most of their goals. The rumor was that “the three percent who had clear, written goals were earning, on average, ten times as much as the other 97 percent put together.” Quite impressive! I’ve since looked for this Harvard study and started hearing that maybe it was a Yale study from 1953 or other such legends. It turns out this activity is just a legend. But that hasn’t stopped me from believing in the power of writing down our goals. So a couple of years ago, I started doing this activity with my students at the beginning of the school year and again when we returned from New Years. I love this activity and the way it gets my students thinking about their lives and what they’re capable of! WEAK GOAL: I want to lose weight this year. STRONG GOAL: I will lose 5 pounds each month of 2016. WEAK GOAL: I want to exercise more this year. STRONG GOAL: I will run 500 miles in 2016. WEAK GOAL: I want to read about marriage with my spouse this year. STRONG GOAL: We will read 2 marriage books this year. The thing I love about big specific goals is they compel me to break them into smaller goals so I can accomplish them. And since they’re specific, it’s not hard to break them into chunks and steps. Let’s look at the running goal, which was actually one of my own goals for 2014. 500 miles … sounds crazy, right!? Well, it’s 41 ⅔ miles a month. Not quite so bad. 1.37 miles a day. Not bad at all. But what if I can’t run every day? Then how about 9.6 miles a week? Or how about 5 4-mile runs every 2 weeks. Break it up however you’d like. The important thing is that YOU CAN break it into chunks. Specific … measurable … time-sensitive. 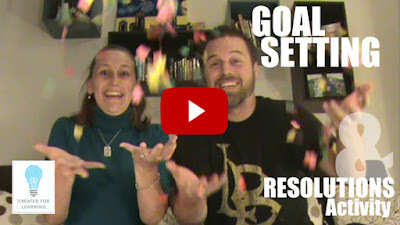 Click the Bulls-Eye to get the FREE goal setting and resolutions activity! Once a month or so, I have them revisit their goals and ask who’s completed any. I don’t know if I can communicate the looks of satisfaction on students’ faces when they share their completed goal. And the satisfaction in my soul is pretty encouraging too! 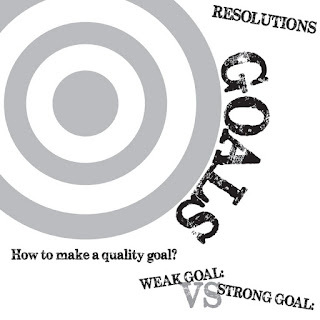 This activity brings the goals back before their thoughts and reminds them of what they have or haven’t done. No guilt. Just motivation. No mistakes. Just progress. Goals aren’t about failure...they’re about trajectory! They’re about desire! They’re about your future! So we’ve created the fun activity organizer for you to use with your classrooms. Enjoy this FREE resource and check out how our other resources might save you time as well. Keep on being awesome!